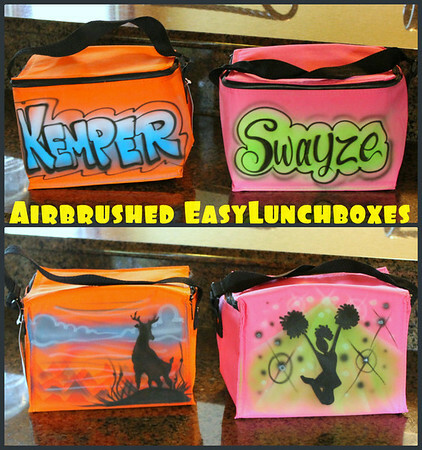 Let our examples inspire you to customize your lunch bags! You can use store-bought trinkets, or even more fun - create your own! PLEASE NOTE: the strap's silver grommet you see in some of these photos has been replaced by a sewn-in, black plastic "ring". Hang a name tag or fun trinket from the strap! Hope sent me these pics. She had the cooler bags beautifully airbrushed. Her kids can't wait to use them when they go back to school. Love this idea!